For 8 years, we took every opportunity to point out that under Barack Obama's administration, US debt was rising at a alarmingly rapid rate, having nearly doubled, surging by $9.3 trillion during Obama's 8 years. 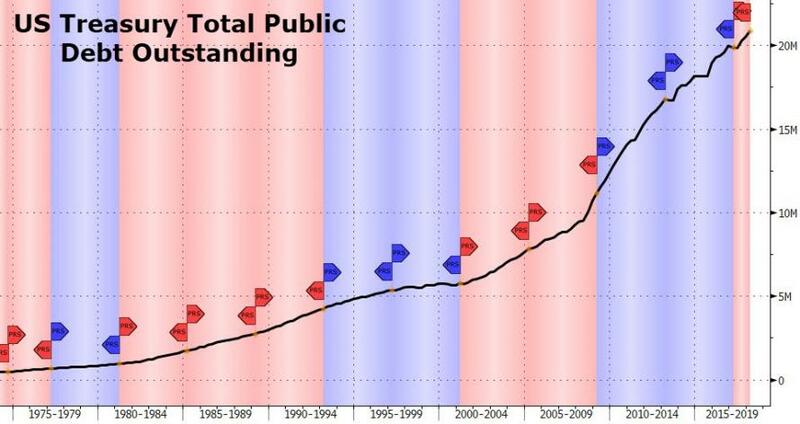 It now appears that the trajectory of US debt under the Trump administration will be no different, and in fact based on Trump's ambitious fiscal spending visions, may rise even faster than it did under Obama. 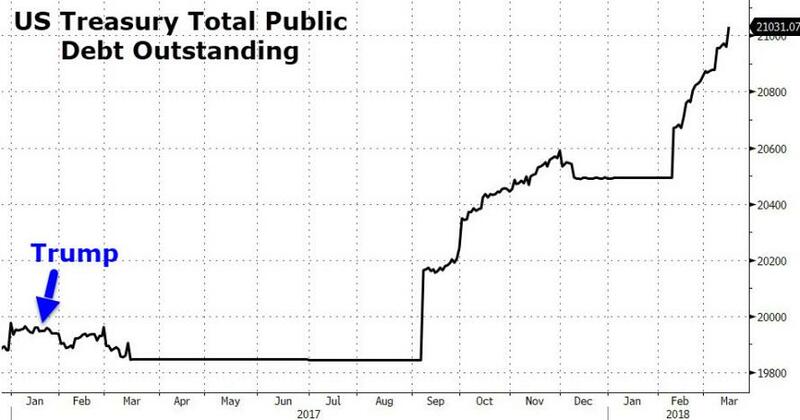 We note this because as of close of Friday, the US Treasury reported that total US debt has risen above $21 trillion for the first time; or $21,031,067,004,766.25 to be precise. Putting this in context, total US debt has now risen by over $1 trillion in Trump's first year... and the real spending hasn't even begun yet. What is amusing is that Trump - who has a tweet for every occasion - and who no longer even pretends to care about the unsustainability of US spending was extremely proud as recently as a year ago by how little debt has increased during his term. 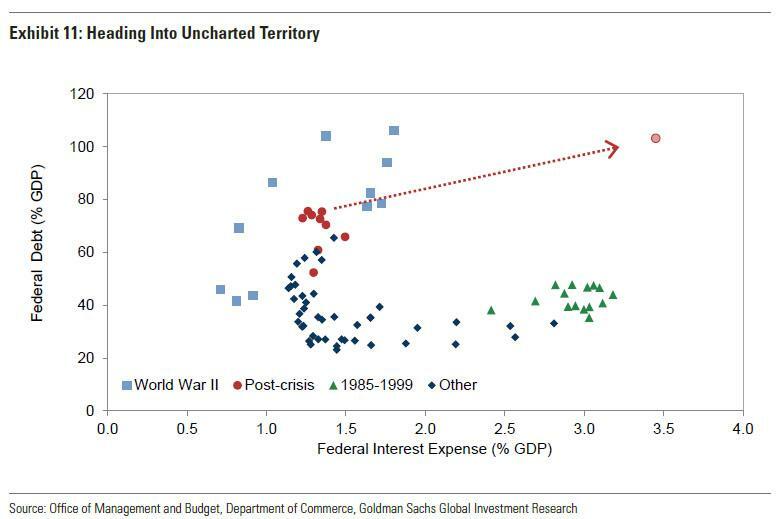 ... one can counter with the following chart from Goldman, which shows that if one assumes a blended interest rate of roughly 3.5% as the Fed does, and keeps America's debt/GDP ratio constant, in a few years the US will be in what Goldman dubbed "uncharted territory" and warned that "the continued growth of public debt raises eventual sustainability questions if left unchecked." 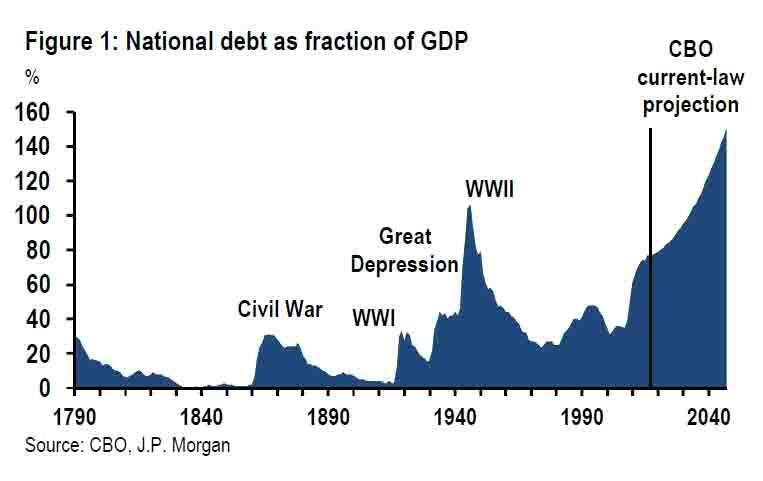 The bad news, however, is that debt/GDP will not be constant, as the CBO recently forecast in what was actually an overly optimistic prediction.